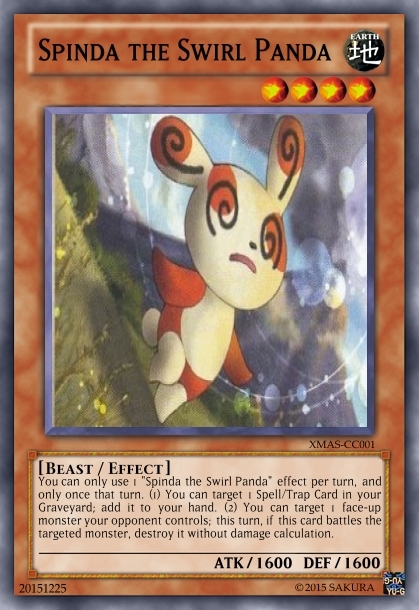 You can only use 1 "Spinda the Swirl Panda" effect per turn, and only once that turn. (1) You can target 1 Spell/Trap Card in your Graveyard; add it to your hand. (2) You can target 1 face-up monster your opponent controls; this turn, if this card battles the targeted monster, destroy it without damage calculation. First effect is supposed to be Recycle (which Spinda can learn via move tutor). As name implies, you recycle a card (although limited to S/T cards). In practice, suppose you can recycle used MSTs or whatever staples you need to take back. Second is supposed to be Sucker Punch (although game-wise, it just allows you to strike first if opponent plans to hit). Here, it's basically effect removal, so that part should be simple enough to understand. I put a hard OPT on both effects, very similar to what Shadow Mist has. Either you choose to recover a card OR become Catastor for a while (on the attack only); both effects are useful. Given Spinda's small movepool (and Smogon being silly about it in the first place), not really much I could do. Based it off of the XY/ORAS set (however useful that turns out to be). Stats are pretty much Spinda's in-game stuff multiplied by 10, then increased by 1000 (similar to how I did the Eeveelutions in another set). So yeah, merry Xmas Spinda (or at least, hope you had a good one). It seems kinda OP considering you can pendulum summon it and gain a load of advantage but it's a really well thought out and nice card! Thank you!